Dmitriy Yarosh is the founder and head of one of Ukraine’s two racist-fascist, or nazi, parties, Right Sector. He is officially the #2 Ukrainian national-security official, working directly under Andreiy Paribuiy, who heads Ukraine’s other nazi party (the party that used to call itself Ukraine’s “Social Nationalist Party,” after Hitler’s National Socialist Party, but which the CIA renamed “Svoboda,” meaning “Freedom,” so as to make it more acceptable to Americans). However, Yarosh has turned out to be Ukraine’s actual leader, despite his not being officially at the top. His nominal boss, Paribuiy, had been appointed by Arseniy Yatsenyuk, who was chosen on February 4th (18 days prior to the coup) to be Ukraine’s new leader, by Victoria Nuland, who was appointed by Hillary Clinton and John Kerry, who were appointed by Barack Obama (the actual ruler of the new Ukraine). As Yarosh said this past March in an interview with Newsweek, he has “been training paramilitary troops for almost 25 years,” and his “divisions are constantly growing all over Ukraine, but over 10,000 people for sure.” More recently, in October, a pro-Government Ukrainian site interviewed Yarosh and he mentioned specifically a “DUC,” or Volunteer Ukrainian Corps of fighters. He was then asked “How many soldiers in DUC?” and he answered, “About seven thousand men.” These would be his real military force, by far the biggest private army in Ukraine. So, in his private files are everyone’s individual background and skill-level as a “paramilitary,” or far-right mercenary, and they all respect and obey him as the top man. He is the indispensable person in this new Ukraine. Yarosh’s teams carry out the most violent operations for the CIA in Ukraine (including the coup). Since these are the people who actually specialize in this sort of political operation, Yarosh basically commands the country. Ukraine is now run on fear, and everyone fears Dmitriy Yarosh. Even Ukraine’s other leaders fear him. He is sometimes shockingly public with his threats against even the nation’s President. Yarosh is the only person who can afford to be. Here you see Yarosh’s people do the coup in Kiev in February. Here you see them do the massacre in Odessa in May. Notice how similar these two operations are. Yarosh’s mind is actually on display in those operations. Yarosh is the person who gave the teams their instructions, and his followers carried these instructions out. Here, in a news report, titled “Nazi NATO, but No War Crimes Tribunal? Why?” you can see photos, and can click onto youtube videos, of Dmitry Yarosh’s people executing his carefully planned atrocities (some in broad daylight), during the May 2nd massacre, and (via the links within a linked-to news report), also executing the February 22nd coup. You’ll additionally see there other such operations, carried out by Yarosh’s teams. The May 2nd massacre was done specifically in order to get the residents in Ukraine’s pro-Russian southeast to fear this new Government so much as to refuse to be ruled by it. (Who wants to be ruled by people who are determined to kill you?) Until the massacre, those people didn’t want full independence from the new Government; but, after it, they did. It’s the reason for the massacre – to get them to demand full independence. Their refusal to be ruled by these people who had massacred so barbarically in Odessa people who were like themselves, made practically everyone in the southeast into “separatists.” This new Kiev Government could then call them “terrorists,” and (with acceptance from suckers in the U.S. and Europe) go to war to eliminate them – to make a free-fire zone of the entire area in which the people who had voted for the overthrown leader live. And that’s what it has been since: a free-fire zone, in which the UN and the West passively accept, when they do not outright endorse, their extermination. Obama needed to eliminate the people in the areas of Ukraine who had voted around 90% for the man he overthrew on February 22nd. (That’s the area of the extermination.) 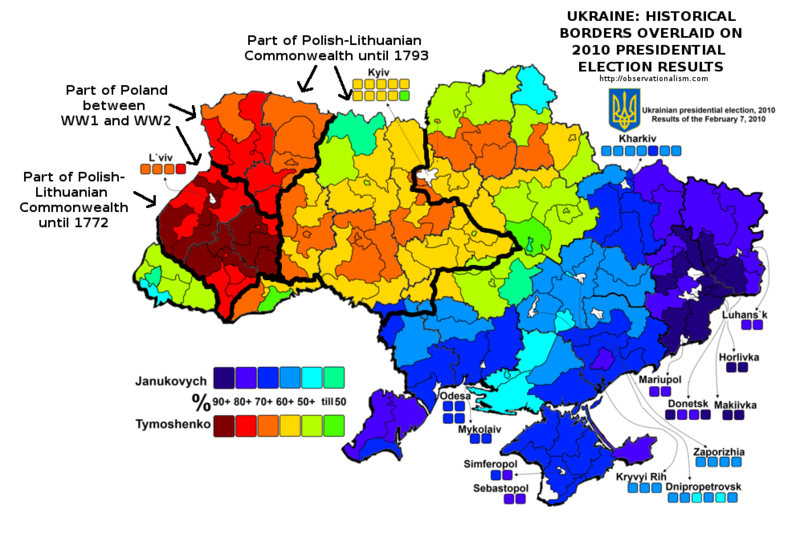 Otherwise, Obama’s coup wouldn’t possess staying-power as a ‘democracy’; it would’t survive future nationwide Ukrainian elections if these areas of almost exclusively pro-Russian voters weren’t ruthlessly destroyed. Those Ukrainian voters thus needed to be eliminated. They were doomed by Obama’s coup-plan, and their doom was Obama’s follow-through on his coup. Dmitriy Yarosh is the indispensable person for such a crucial political task as the elimination of Yanukovych’s voters – and that’s the reason why Yarosh now essentially rules Ukraine. He says that the reason they need to be slaughtered is that they are “separatists” and “terrorists.” But Yarosh himself had fought alongside Chechen Moslems in Russia for Chechnia’s independence from Russia. He said that their battle is heroic. Bottom line on Yarosh is that what Jews were to Hitler, ethnic Russians, and all of Russia, are to him, and to the entire movement that he represents, which were Ukraine’s Hitler-supporting organizations during World War II. This anti-Russian form of nazism doesn’t go only back to the German Nazi Party; it’s indigenous to northwestern Ukraine, which is why Ukraine has two native nazi parties, not merely one. Here are Yarosh’s people, marching. Here they are as an elite battalion slaughtering people in the extermination-zone. U.S. politicians are lucky that Yarosh doesn’t speak English, and wasn’t born in America. He’d probably win the Republican Presidential nomination (though with rhetoric that’s even milder than what he sports in Ukraine), and go on to win the U.S. Presidency, if he were an American, rather than merely being paid by U.S. taxpayers (and by some of America’s and Ukraine’s oligarchs), such as he is now. In today’s world, charming people can be like Adolf Hitler, or Benito Mussolini, or Emperor Hirohito, none of whom was charming. After all, America is now on the fascists’ side ideologically, except that it’s for rule by U.S. oligarchs, not by German, Italian, or Japanese ones. It’s for America’s oligarchy to be the masters of other nations’ oligarchies, rather than for other nations’ oligarchies to be the masters of ours. The shoe’s on the other foot, now, that’s all. Fascism, even nazism, finally won. Hitler, the admirer of “the Big Lie,” would get a big chuckle out of such a posthumous ideological victory. Especially since the people whom Obama placed into power in Ukraine are Hitler’s passionate followers in their wanting to subordinate or else destroy all Russians, which had likewise been an aspiration of Adolf Hitler. It’s supremacism, but for a different group of oligarchs, that’s all – America’s.